The babbles of a steampunk, writing and acting nerd. I finished this book in two days. Technically, less than that as I started it in the afternoon, then finished the next day when I woke up. It’s just one of those books that you absolutely cannot put down. But I’m not entirely sure if I liked it. This is a spoiler free; there are vague mentions of some aspects, but nothing I would consider a spoiler that’s not alluded to in the description. When Cameron Post’s parents die suddenly in a car crash, her shocking first thought is relief. Relief they’ll never know that, hours earlier, she had been kissing a girl. But that relief doesn’t last, and Cam is soon forced to move in with her conservative aunt Ruth and her well-intentioned but hopelessly old-fashioned grandmother. She knows that from this point on, her life will forever be different. Survival in Miles City, Montana, means blending in and leaving well enough alone (as her grandmother might say), and Cam becomes an expert at both. Then Coley Taylor moves to town. Beautiful, pickup-driving Coley is a perfect cowgirl with the perfect boyfriend to match. She and Cam forge an unexpected and intense friendship–one that seems to leave room for something more to emerge. But just as that starts to seem like a real possibility, ultrareligious Aunt Ruth takes drastic action to “fix” her niece, bringing Cam face-to-face with the cost of denying her true self–even if she’s not exactly sure who that is. This isn’t a romance book. There is plenty of it, but is not centered on the character ending up with so and so. That was interesting. It’s realistic that a teenager wouldn’t meet their soul mate within fourteen years. At least that doesn’t happen very often. I really hope Cam met one eventually. Or at least met someone soon that treated her well. Speaking of fourteen, I’m always a little squeamish (probably because I’m seventeen) when young teens have….erh, intense romantic scenes. This, like most YA books had that, and again, I was uncomfortable, especially as at one point Cameron has (not as intense, but more serious) moment with a college girl, Moria. That is my real disagreement with the book. Since Cam was fourteen and Moria certainly wasn’t close in age, I wish that factor had been addressed more. I know they weren’t the romantic focus, but a age gap like that needs to be clearly shown to be dangerous. Teens need to know that. It needed to be addressed more, because a fourteen year old and a eighteen year old (or older) is certainly wrong. People get upset over Tris and Four, but this is even more concerning. It’s sad, because if it weren’t for that, the book would have earned five stars. In the other rating style I give it a PG: 13 or Teen. 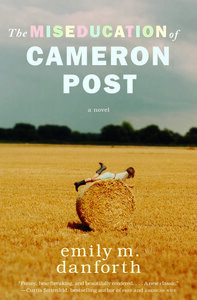 Have you read the Education of Cameron Post? What were your thoughts on it? So this month is self-published books month at the TCWT blog chain! For that, I read(or rather, am reading as I just download it yesterday. I am already more than halfway through. 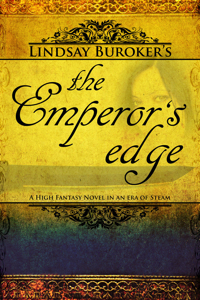 It’s that good) The Emperor’s Edge. It’s a steampunk book that’s absolutely amazing. Amarathe is our lead character, a proper(according to one member of the team. There’s quite an entertaining scene where four of her team members spend a conversation deciding what the right word for her is) enforcer. However when she learns of a conspiracy against the young emperor, she knows that she needs to do something about it and that just might mean enlisting the help of Sicarus, a famous assassin and a rag-tag team that she assembles. I only found two typos so far, and those were only a case of two words not having a space between them. That may have just been the way my Dad’s kindle formated it though, or the way I read it. I know I often think that when reading, well critiquing, books people send to me on Microsoft Word. It’s free to download, if you go to her website, and there are several more books in the series, and some more to be released as well. I strongly recommend checking it out, even if you aren’t, like me, into reading e-books. I think there might be a way to read a paperback copy as well, though I’m sure that wouldn’t be free, but probably very reasonably priced. And when you’re caught up, check out the fan-forum. There’s even fanfiction! “Jane’s stories are too sensible. Then Diana puts too much murders into hers. She says most of the time she doesn’t know what to do with the people so she kills the off to get rid of them.” So, The Clockwork Angel won the poll. And Anne, it’s certainly much better then either Jane or Diana’s. Tessa Gray just came to London to live with her brother. Instead she is kidnapped by two sisters, Mrs. Dark and Mrs.Black. They make her ‘change’ into other people. People that are dead, and she relieves their last memories. The two want to marry her off to someone named The Magister. Then the Dark Sister’s house is attacked, and Tessa is rescued by Will Herondale. She is taken by him to the Institute of London, the home of Shadowhunters– half-human, half-angel. They hunt demons, and other dangers of London. And there is something about Tessa. She’s not a Shadowhunter…but what is she? I really enjoyed this book. It’s one of those books that I couldn’t stop reading …I am a quick reader, but it is a rare thing when I just can’t stop reading a book. I like Tessa. She was confused by what was going on, and she was scared, which I think is realistic. At the same time, she was definitely a strong female character, and I loved her witty tongue. That brings us to Will, since he often invoked that witty tongue. Will was such a crazy, funny character. I love him. He has a secretive past as well, which you won’t find out about until the second book(The Clockwork Prince). His love of books was something that also endeared him to me.I mean, how can I not like someone who loves books? And then Jem. Is in most books today, there is a love triangle. However, this is one I actually cared about. And Jem and Will are more than just rivals for Tessa’s heart. Jem is deathly sick, and he is told he won’t live for very long. He has bouts of sickness where he’ll cough blood, and then only thing that helps him is a dangerous drug. Will is devoted to making sure he gets this drug, and they are Parabati— two Shadowhunters who are bonded together, who are a team. Brothers. They are more than just ‘the two boys she has to choose between’. Oh, and I love Sophie. Can we have even more Sophie in the third book(we get quite a bit in the second book) please? And Charlotte! And Henry! They’re just…so…one of my One True Pairings now. Just sayin’. And Henry is adorable. I want to cuddle him. He’s like a red bear teddy bear. The ‘bad guys’ were interesting too. I think they were the kind that really is bad, but…some…well, there are some twists to who is bad, and who isn’t. You’ll enjoy it. So, all in all, I loved The Clockwork Princess! Coming soon: The Weirdest Meme. I love Lenka. She’s such a quirky, adorable individual. And her music is so unique. If you’ve never heard her, you’re missing out. *nods along to the beat* I’ve never heard someone like her before, and it’s really nice to find someone who has her very own style that way. This had been rather short….so I add content with a poll. What book would you like to see me review? Mare’s War: I’ve just started it, but it’s really good already. I love books that tell two stories in one–also, it’s an interesting time period, and the side that it’s told from is not written about much. It wouldn’t be a very interesting time period if it weren’t for that. The Mortal Engines: Steampunk, steampunk, steampunk! *dances around* As atale of a girl with a scarred face, a Historian Apprentice, and the Mayor’s daughter, it was very good. A bit…dark…but a very interesting take on steampunk. The author is admired a lot by Cassandra Clare(his series are the reason her series name’s are The Mortal Instruments, and The Infernal Device). A teenage girl with the liking for writing. She also can't rhyme, apparently. You know you want to follow!